Dad playing his banjolele and singing George Formby songs, or at the piano singing other favourites, was a constant. Along with my sisters, I’d sing along, too, and found great joy not only in this, but also in listening to Dad’s tales regarding various artists of his time. We, (Mum, Dad, older brother Peter, and older sisters Annette and Susan,) had one little silver radio with a black leather cover. Although music played across the radio, its main function was for the delivery of news, radio serials, and sports results. Apart from a photograph of George Formby, I had no idea what the people in my father’s stories looked like, nor knew how they sounded, as we didn’t own a television until I was about 10, nor a record player until I was about 20. When we eventually had electricity connected to the farm, these artists were revealed to me over time. My mother’s side of the family loved country and western music, and during weekend visits to their farms I would hear many Slim Dusty records. On my 7th birthday, I received a little varnished timber ukulele. I felt I owned the world that day! Dad showed me some chords, which I found extremely difficult to shape as he was left-handed and I was not. Eventually, I played and sang my first song, My Bonnie Lies Over the Ocean, on my very own instrument. I still have that treasured ukulele! During my primary school years I wished I was Catholic when, each week, I would see the nuns arrive with their guitars in readiness for religious education classes. I’d hear their singing reaching across the school and I badly wanted to be part of it. Fortunately, there was other music at school to be enjoyed, and it was there that I was introduced to folk music. 'The Broadcast' was one source, filling each classroom via a large speaker at a designated time each week. Also, a few teachers were very musical. One taught us Australian folk songs, another brought a little of Burl Ives into our lives. Opportunities to join the choir, and play recorder in the school band were seized, and I enjoyed these musical outlets immensely. I was around 10 years old when our house was finally connected to 240v electricity. P.A.R.A.D.I.S.E!! Soon after, we had television and somewhere within the next few years I was to watch a Glen Campbell show and hear a sound that struck something within me that has never let go. The sound of a banjo! It rang out clearly while fingers were flying on the strings. I was also to hear Glen Campbell sing John Hartford’s, Gentle On My Mind, which has remained, to this day, my favourite song of all time. Musical instruments in our home around this time consisted of a banjolele, ukulele, piano, and a saxophone. My brother began teaching himself to play saxophone, and my two sisters and I were sent to a local piano teacher for lessons. This lasted a few years and although I am grateful today that I was given that opportunity, I rarely practised. During one school holidays, I learnt to play a few songs on a piano accordion from an auntie at Ravensbourne, near Toowoomba. While visiting her parents one afternoon, she brought out her mother’s much smaller sized accordion for me to use. I moved out to the back verandah of the house overlooking their farm just as a magnificent, gently rhythmic scene was unfolding before me. As I sat practising, two horsemen slowly moved a mob of cattle from the lower paddocks up through the silky oak trees, passing by me, then into another paddock. The holiday eventually ended and I went home with enough skill to have a little fun on a piano accordion, coupled with the memory of a beautiful scene intertwined with the learning of that instrument. Over the following years I had my fill of favourite pop stars and bands. My school friends had record players and whenever I hung out at their homes, I was now listening to whole albums of bands such as Dragon, Sherbet, Ted Mulry Gang, Little River Band, to name a few, that were popular on the TV show, 'Countdown'. After my parents retired, Mum, Dad, Sue and I moved to Caboolture. With a stereo system now gracing our lounge room, I frequented 'Barry’s Music Store' and began building my own collection! I started listening to The Beach Boys, Rodriguez, Dusty Springfield, John Denver, and although I could enjoy music across different genres, I found listening to country gave me the greatest pleasure. I also found that my voice seemed to fit best in country. Marrying in 1989, moving to Yarraman (near Kingaroy,) then having two children, and now owning a guitar, I would entertain my little family. I loved listening to, and then learning the songs of Shania Twain, Trisha Yearwood, and Gina Jeffreys. Although growing up with live family music, and attending local town concerts, experiencing professional live music had been an extremely rare occurrence for me. Kingaroy Town Hall was the venue for a number of Australian country music artists and I began seeing some of my favourites live in concert. I loved these nights! Via television, I also followed Australia’s ultimate country music awards night, 'The Golden Guitar Awards', held in Tamworth each year. I was invited to attend the awards in January 2016 with 'Bush Ballad of the Year' nominee, and winner, Manfred Vijars. The entire experience was dreamlike, and one of pure joy! With much gratitude, I have been invited, once again, to join Manfred on the red carpet at the 2017 Golden Guitar Awards. Moving to Brisbane with my children, Daniel 7, Tammy 5, came in 1998. We joined Scott, my husband, who had begun working in Brisbane ten months earlier. Birthdays passed without too much fuss – until in 2005, thirty years after having fallen in love with the sound, I decided I wanted a banjo! I would work out how to find someone to teach me at a later date as I thought I would have to travel out west to find such a teacher! Into Billy Hyde music store, Fortitude Valley, we went. I knew what a banjo looked like and sounded like - nothing else. Not only did I leave the store with my new instrument - from the shop’s noticeboard I held a piece of paper which read, Banjo teacher, Peter Nahuysen. I found that Peter lived 5 minutes away, and so began my banjo lessons back in 2005. Peter organized the very first Australian Banjo Conference which was held in Maleny in December 2008. I attended, and from that weekend on I knew exactly where I wanted to be - in the world of Bluegrass! He has enabled me to meet some incredible musicians, and have the chance to be on stage with them during the student concert section of these camps. Meeting Jenny Lester (Canada) from the band, Hungry Hill, brought a song of hers to my attention, 'Crooked Log Cabin'. I recently recorded that song on Wayward Angels debut CD. USA band, X-Train, had me floating on air one year when I heard band members adding harmony vocals to the song I was performing. Australia’s, The Company, added their magic to my performance another year. Playing and singing one afternoon with Jens Kruger and Joel Landsberg, from The Kruger Brothers, was something incredibly special. And as recently as the December 2016 Bluegrass Conference, I had the chance to perform with the amazing Sonoran Dogs bluegrass band (USA,) during the student concert. Peter Nahuysen has provided many Australian lovers of bluegrass with some phenomenal moments! 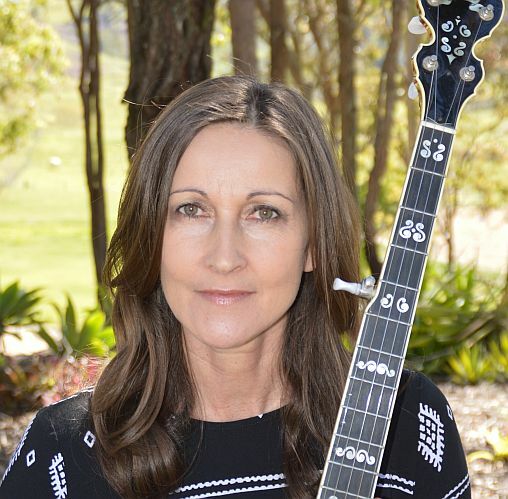 The first Australian Bluegrass Jam Camp was held by Greg McGrath at Caloundra in 2011. As well as a great learning experience, I met many new people, one being Peter Wyndham. He invited me to a regular jam in Brisbane run by himself and Paul Mills. From then on, I found myself jamming fortnightly. Playing with others on a regular basis was something I had not experienced before, and it made a huge difference to my progress. This also introduced me to people that I would, later, join with to form a number of practice or performance bands:- Baby Bluegrass; Jam; Blue Harmony; Wayward Angels; Sassafras Avenue; and also the incredible opportunity to co-host, with Sassafras Avenue band member Gary Vann, the Delaneys Creek Jam Camp. I then began hearing about live music venues within Brisbane, one in particular, The BUg, where I continue to meet lovers of all music, especially Folk. Here, I began performing in public other than a camp concert setting. Jamming with others also brought my attention to the festival scene. I started attending festivals, then playing at festivals on both banjo, and double bass. Having my son, Daniel, add bass on occasion to Blue Harmony, has given me some of the sweetest, proud moments on stage. 2017 is a year of new beginnings! I am very much looking forward to sharing many more musical moments both here at home, and overseas, with wonderful people I already have the pleasure of knowing, and to those I’ve yet to meet.